This spa town of Merano is memorable due to its alpine-Mediterranean climate, lush promenades, lifestyle, and city flair. 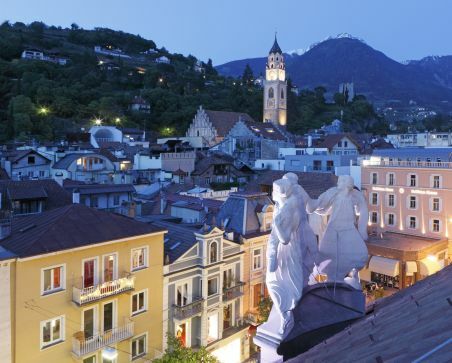 If you are spending your holidays in Italy and travelling through Switzerland, Austria or Germany via the Resia Pass or the Brennero Pass, you should stop for a night in the enchanting city of Merano in South Tyrol. Merano is located between 263 and 1.621 m above sea level and includes the village districts of Quarazze, Maia Bassa, Maia Alta, Sinigo, Labers and the old town. In Merano you can enjoy a walk along ancient irrigation channels, which were designed by farmers to irrigate the fields. The irrigation channels date back to ancient times and are typical of this region. The water from the rivers of the side valleys reached the fields through canals, grooves in the rocks or wooden channels. Over the years modern systems were developed, and only a few channels are in operation today. Some of these, and the maintenance paths along them, are now popular hiking paths for tourists and locals. If you visit Merano in summer, you will be welcomed by a splendid spa town with a vast choice of cultural offerings, as well as the two villages Lagundo and Tirolo amidst unspoiled nature. These villages are small but fascinating and rich in history. In this area you can enjoy various activities like hiking, cycling, tennis and horse riding. If you visit Merano in winter, you can enjoy a skiing day at the Merano 2000 ski resort in the vicinity of the main town of the Burgraviato region. High above the spa town 8 lift facilities, 40 km of slopes, and a wide range of family activities await you. The wide range of accommodation in Merano offers high standards to suit all tastes. We recommend the Hotel Westend, a 3-star hotel in the centre of Merano in an historic liberty style building. The owners, the Strohmer family, welcome you and will do their best to make sure you enjoy a comfortable stay.